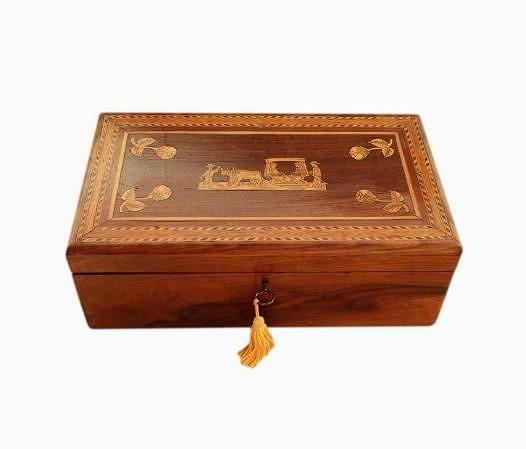 We sell beautiful antique jewellery boxes from the Victorian, Georgian and Edwardian periods, and vintage jewellery boxes from the Art Deco period and onwards to the 1980s. 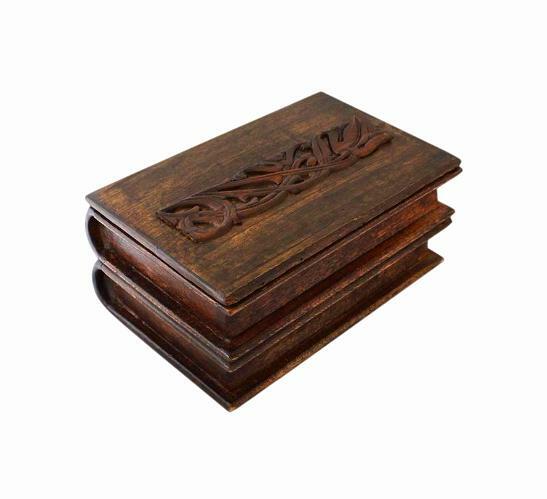 The majority of our boxes are made of wood, from beautiful varieties including Walnut, Rosewood, Mahogany, Satinwood, Oak and Olive Wood. Many are inlaid with decorative materials such as Mother of Pearl, hardwoods, fruitwoods and Brass, and many are beautifully hand painted. Some are finely detailed with forms of birds and insects, such as beautiful Swallows and Butterflies, and some have beautiful organic subjects such as Roses, Pansies and Forget Me Not's. Many of these subjects have symbolic endearments which are very meaningful to the recipients of our boxes! 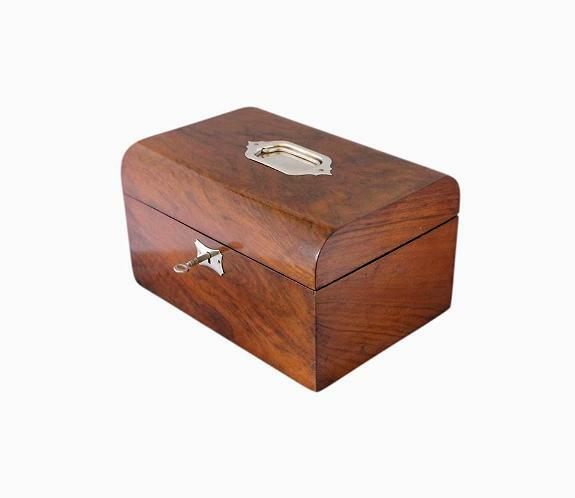 Many of our boxes have luxurious interiors, lined with satin, silk and velvet, and most have their original locks and keys. 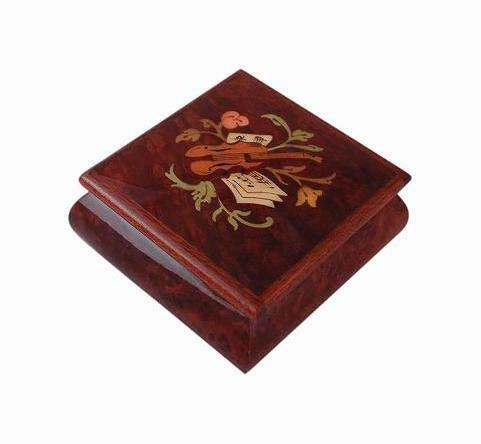 We have several lovely musical boxes with tunes which again can be very meaningful, and we have boxes made from other materials such as Silver, Leather and Papier Mache. 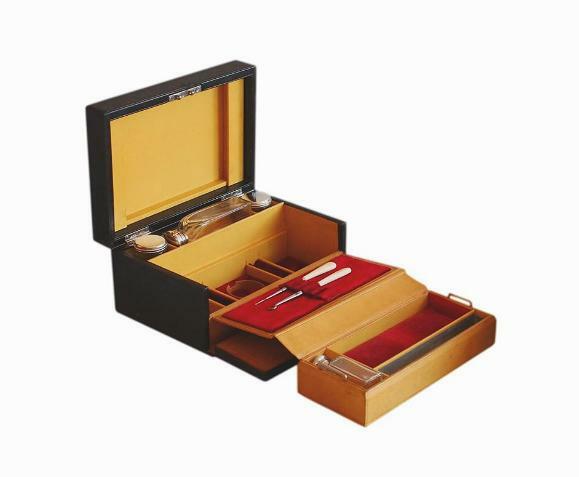 We also sell presentation boxes for individual pieces of jewellery, and have some beautiful little pill boxes as well. 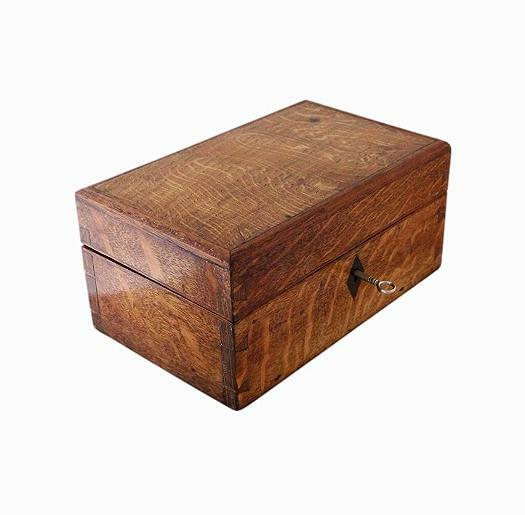 From classic Victorian Jewellery boxes, to stylish angular Art Deco jewellery boxes, we cater to suit all tastes, and if you don't happen to find what you are looking for, we have a Source A Box service available! This is completely free of charge and you are not obligated to purchase the boxes we find for you. Our boxes come from all over the world, from England, France, Italy, Scandinavia, and Japan, to name just a few places. Many of our European boxes have secret double locking mechanisms! Enjoy £10 off your 1st order + FREE Next Day delivery in the UK. Enter promotional code NCD10 at checkout and click recalculate to receive your discount. A selection of our jewellery boxes. Please click the photos to view and purchase. Beautiful kitsch Japanese vintage jewellery box, dating to the 1980s. 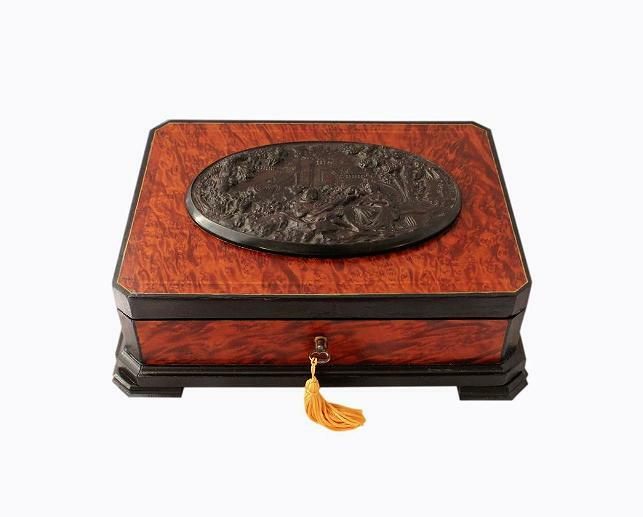 The box features a large enameled heart with two mirrors, a cased floral display, beautiful floral decoration and two storage drawers. Beautiful 1930s Italian vintage jewellery box, made in Sorrento, Italy. Made of solid Olive wood. Beautiful hand painted Swallows to the lid and quilted pink silk to the interior. Working lock and key. Beautiful French antique jewellery box, circa 1900. 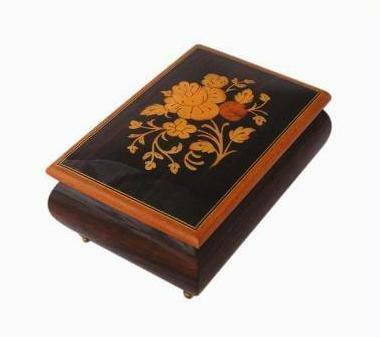 Lovely Rosewood veneer and very pretty floral marquetry inlay. Beautifully refurbished interior with satin and floral paper linings. Stunning Italian vintage musical jewellery box playing 'Come Back to Sorrento'. Beautiful exotic Zebrano and striped Ebony wood veneers. Beautiful inlaid scene on the lid. Beautiful vintage Italian jewellery box, made in Sorrento in the 1970s or 80s. Beautiful shimmery vitreous enamelled finish and lovely floral inlay. Red plush velvet lined compartment. Beautiful 1930s vintage jewellery box, made in Italy. Hand painted flowers and mosaic inlay to the lid. Original quilted red silk interior. Bespoke made hand painted panel inside the lid. We provide full and thorough descriptions of our boxes and research every one to bring you as much information about it as possible. Numerous photos are also provided so you can be sure to choose the perfect box. All of our boxes are available to post immediately, and are sent securely packaged in sturdy boxes to keep them safe during transit. Your order includes free postage within the UK by Royal Mail Next Day Special Delivery, and we have a no quibble 28 day returns policy for your peace of mind. We post worldwide! Please see our Orders And Delivery page for full UK & International shipping details. As a new customer you can enjoy £10 off your 1st order (see the offer above) and we have a fabulous customer loyalty scheme where returning customers can receive a big 15% discount on all subsequent orders. You will receive your 15% discount code by email, after placing your 1st order with us. The Old Jewellery Box Shop was established online back in 2008. We are a trusted company with many years of experience, selling in shops before moving our company onto the internet. You can read much more about us and what services we provide by viewing the following page! We are very friendly here at The Old Jewellery Box Shop so please don't hesitate to get in touch for any help and advice. Please call us on 07595 492846. Alternatively you can contact us here or via our social media pages below! Follow us on Facebook for our latest additions and promotions. Read about our Facebook page here. The Old Jewellery Box Shop's Facebook Page.